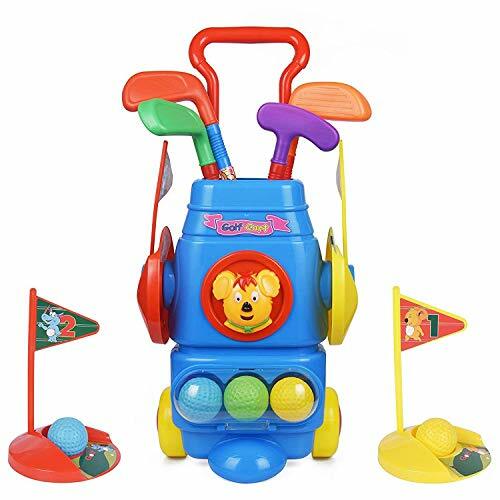 Introducing The Toyvelt Kids' Golf Club Set! Does your kid love golf? Do you want to teach your kid how to play golf? Do you wish your child was more athletic and outdoorsy? Are you looking for a toy that can make your child forget about technology? If you have answered "yes" to at least one of these questions, it means that you need the Toyvelt golf cart toy set for kids! Once your kid starts playing golf with these golf accessories, you can be sure that they will love this sportand learn many new things. Why Choose The Toyvelt Golf Cart Toy? This kids' golf club set will not only keep your child entertained for hours, but it will also promote their physical and mental development. More specifically, while playing golf with the golf sticks and balls, you kid will be moving multiple muscles, so they'll be working out. At the same time, your child will learn to be patient, calm, focused, and to never give up. These are important skills to have. Get A Golf Cart Set For Kids Today! The golf stick set is a great way for parents to spend some quality time for their kids and have a hobby that they can share. So get this golf club toy for your kids or for the child of a family member or friend, and let the golf games begin! Scroll Up, Click The "Add to Cart" Button, And Place An Order NOW! A FUN WAY FOR YOUR KIDS TO WORK OUT: The kids golfing set is not simply a toy, but a great way for your kid to work out and love sports. Golf may not be an intense sport, however, it puts in motion multiple muscles of your entire body. In other words, the kids golf clubs set will exercise your kid's upper limb muscles, back, and legs,and it will promote a healthy development of their joints and ligaments. Athletic kids are healthy and happy kids! PROMOTES PHYSICAL AND MENTAL DEVELOPMENT: Apart from promoting your kid's physical development, the golf cart toy will also promote your kid's mental development. Golf takes a great deal of concentration, patience and manners, so playing with these golf clubs and balls will enhance your kid's observation, imagination, and judgment skills, and it will help them adopt the culture of healthy competition. Any parent would want these things for their child! A COMPLETELY SAFE CHOICE FOR YOUR KIDS: While regular adult golf clubs can be heavy and dangerous for kids, these kids golf sticks are very lightweight and absolutely safe to use Toyvelt has used non toxic and completely harmless yet durable material to ensurethe safety of yourchild and the longevity of the golfcart toy accessories. You can trust Toyvelt, because we're experts when it comes to kids toys. Your kids safety always comes first! A GIFT THAT ANY KID AND PARENT WOULD LOVE: The golf club kid's toy is a great gift for kids, whether they're girls or boys. If you give the golf toys set to a kid in your family, you can be sure that also the parents will love it! The golf ball toy could be a great way for those parents to spend some quality time with their kids and bond more as they teach them how to play golf. So stop searching! Simply click the "Add to Cart" button and make the Toyvelt golf set yours! View More In Toy Sports. If you have any questions about this product by ToyVelt, contact us by completing and submitting the form below. If you are looking for a specif part number, please include it with your message.